Hi, I'm Necro and I'm the creator of AlwaysBeRunning.net and KnowTheMeta.com. I provide these websites and services free of charge for lovers of Netrunner all around the globe. I'm doing this in my spare time. I would appreciate your support and get a warm, fuzzy feeling that my work matters. Please mention your NetrunnerDB username while donating! As any warm-blooded Netrunner player, I love alternate art cards. Unofficial alternate art, tokens, items are also welcomed. Email me via alwaysberunning (at) gmail.com for my postal address. If you have the opportunity to meet me in person then you are most welcomed to join me for a drink. I live in Hungary and mostly participate in events in Central Europe. Feel free to message me if you are attending a tournament near by. If you want to support me with a one-time donation, PayPal is the way to go. Choose any amount you wish. As you know, FFG is discontinuing Netrunner. This makes me deeply sad. Probably there will be no major updates to my sites in the future as I'm putting my time into other projects. The servers will keep on running. Thank you so much for your past, present and future support. This is me getting busy with AlwaysBeRunning.net. I know, "number of commits" is a bit obscure for measuring effort. The main takeaway here is that developing a site takes time, which is a valuable asset. I have to pay for hosting, but the main cost is my effort I put into developing newer and newer features for the site. In the end I hope it is useful for you and I can help Netrunner communities grow. 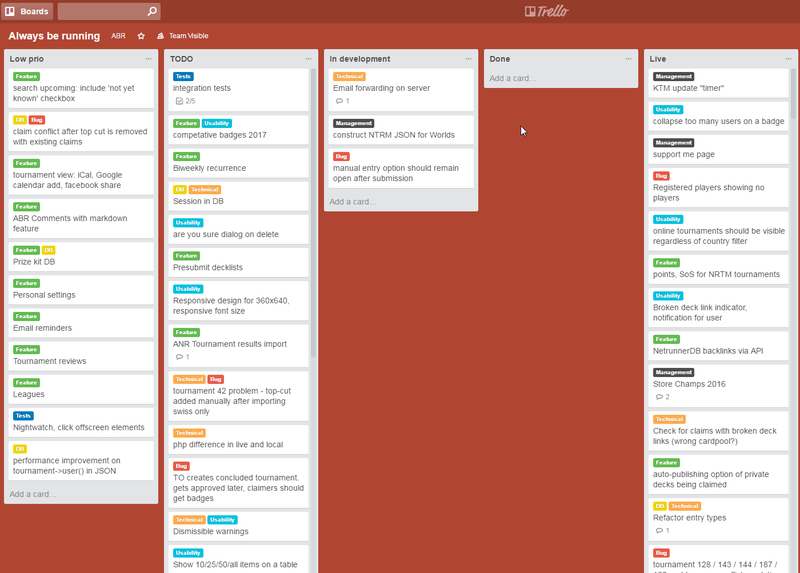 This is my Trello board for AlwaysBeRunning.net development. Usually I announce new features on my Twitter, but there are lot of things going on under a hood. There are also bug-fixes, minor tweeks, usability improvements. Anybody can add feature requests on GitHub (as new "issue") or by dropping me an email. I will add them to this huge list and prioritize according to user-happiness-impact and coding effort. As you can see there's always another feature to code, which requires my time spent developing. I'm posting summaries of newly developed featues to my Patreon page.